Ah, the age-old relationship dilemma: one person loves to eat XYZ, the other not so much. For my folks, acorn squash is one of those things, and my self-appointed challenge this fall was to come up with a couple ways to prepare it that everyone would enjoy. The charred fall vegetable tacos were a big hit with them both, but when Dad showed up at home with the BIGGEST acorn squash from Trader Joe’s — after all, they’re all sold for a buck and change no matter the size — tacos alone were not going to cut it. And they were definitely looking for something a little less rich and involved than pumpkin stuffed with everything good. The first time I threw together this maple-roasted squash, it was admittedly a bit of an afterthought, just a simply-seasoned accompaniment to a butterflied, roasted chicken. But then an unexpected thing happened: when Mom got up for seconds, she returned with a couple more spears of roasted squash. And then went back for more. Ding ding ding, we had a winner! Using maple sugar instead of syrup is really important here for two reasons. First, the sugar can be sprinkled onto the squash in a very controlled manner. This means more sugar ends up on each slice of squash instead of dripping down onto the bottom of the pan, creating a sticky (burnt) mess. Second, anything with a high water content will inhibit the caramelization of the natural sugars in the squash — we wouldn’t want that now, would we? With that said, if you can’t get your hands on maple sugar, I recommend substituting Domino Brownulated sugar or crushing up a couple pure maple sugar candies (you think I’m kidding, huh? I’m not!). Preheat oven to 500°F. Line an 8″x8″ square baking pan (bottom and sides) with a sheet of foil, preferably nonstick; set aside. Trim ends from acorn squash. Prop squash up on one of the cut ends so it doesn’t roll around; halve and scrape out seeds and stringy interior. Following each ridge in the squash, cut each half into about 1″ thick strips. Rub wedges on all sides with the oil. Arrange strips snugly, skin side down, in the foil-lined baking pan. Sprinkle maple sugar evenly over the squash (try to get it just on the veg instead of letting it fall to the bottom of the pan). Sprinkle with salt and pepper. 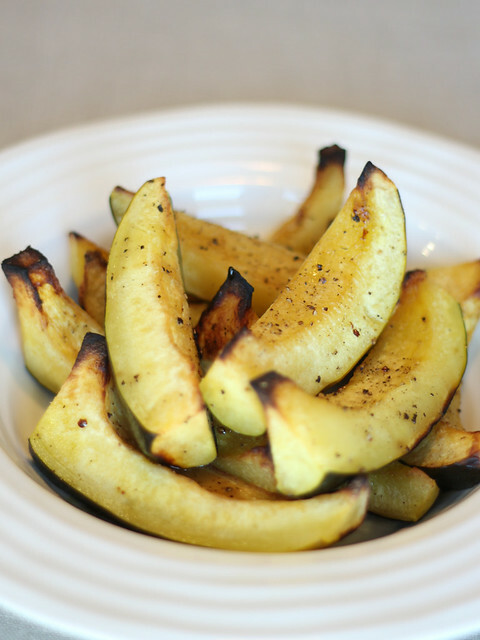 Roast squash until tender and browned, about 30 – 40 minutes in the preheated oven. Serve hot, no need to remove the skin¹. ¹ If folks want to remove the skin, they can easily do that to their serving table side — it pulls away very neatly with fingers or a fork and knife.